There are lots of good travel apps out there right now. The one I have been using to track Travelmista is FlightAware. You can either go the their website at www.flightaware.com or download the FlightAware app on your smart phone. Today Travelmista is flying from Tokyo NRT to Chicago ORD to Copenhagen CPH. While he is in the air I use FlightAware to see where he is and track his flight. I can see that he has 5 hours left until he is in Chicago and currently over the Pacific Ocean between Hawaii and Alaska. 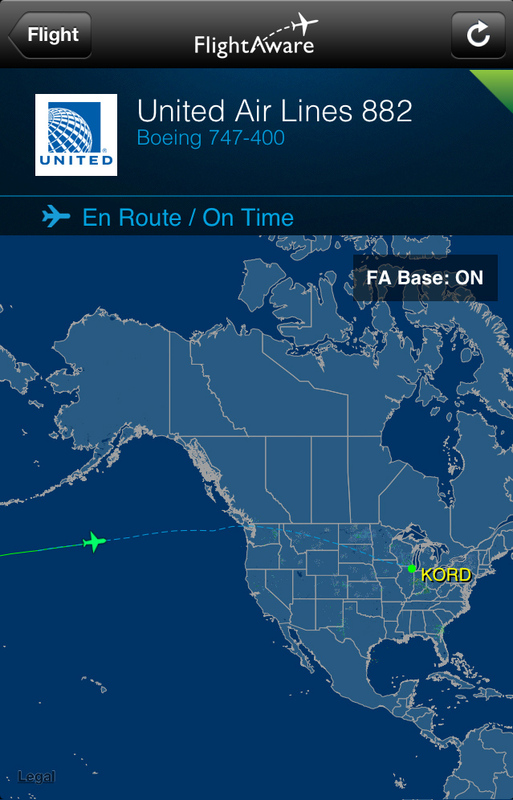 To track him all I need to know is the flight number (882) and what airline he is flying (United). Enter the data and BINGO I know where in the world is Travelmista. I would highly recommend using this website or app. For those who are wondering if flying Japan to Europe west would have been faster than flying east to Europe. It was exactly the same amount of time 34 hours once you figured in layovers plus it was cheaper to fly east and there were more routes in case something went wrong with the flights. The bonus of this is Travelmista will also be flying United the entire way in which he will be obtaining his United 1K status on the flight from ORD to CPH! -30% point bonus + 500/1,000 bonus points or food & beverage amenity each stay. -Regency Club Lounge access and 4pm late checkout. Travelmista was able use the Regency Club Lounge for Breakfast and the Late checkout. He texted me that he already loves being a Diamond member at Hyatt. Surprise! We are going on a Mediterranean Cruise!